Fancy a scrub and a smoothing treatment, but not sure where to start? Don’t worry—we’ve rounded up some of the best hammams in Dubai to take the stress out of choosing a spa. The One&Only’s Oriental Hammam spa is a stunning private venue tucked within the resort’s beautiful manicured gardens. For a treatment worthy of a queen (or king), opt for the Royal Hammam, an 80-minute ritual involving a Moroccan black soap rub, full body scrub, ghassoul clay body wrap and a honey facial, rounded off by a blissful massage. Allow yourself time before or after your hammam to enjoy the opulent facilities and surroundings of the Palazzo Spa, which boasts luxury relaxation rooms and a jacuzzi. The two-hour Ceremonial Hammam starts with a black olive soap rub, followed by a kessa mitt scrub, an exfoliation with MarocMaroc balm, a softening milk wash and a soothing hair and scalp ritual, followed by a relaxing full body massage. Hammam guests also receive a nazar bracelet (the Arabic eye symbol) as a gift. For those who want an authentic Turkish hammam, this luxury resort on the Palm is a great option. The Traditional Turkish Bath Ritual is a 45- or 60-minute treatment that includes an exfoliating scrub on a heated marble bed in the opulent hammam spa, a gentle hair washing, and the warm application of olive oil-infused bubbles. As a final touch, the therapist will apply a rich body oil to leave your skin soft and supple. The Saray Golden Hammam may be the most extravagant option on this list. The two-hour treatment takes place in a private hammam room and comprises a black soap scrub on a marble bed, a gold clay and myrtle body mask, and an Arabian honey face mask, followed by full body massage using pure gold-infused oil. 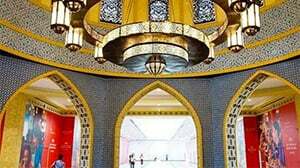 No list of hammams would be complete without mentioning the Talise Ottoman Spa at Jumeirah Zabeel Saray, the largest spa of its kind in the Middle East. Despite the opulent surroundings, the 45-minute Turkish Hammam is as traditional as it gets, involving a seriously exfoliating scrub, followed by a soothing, fluffy cloud of soap. The Iridium Spa at this Al Habtoor City hotel is the picture of understated elegance. The Traditional Majestic Hammam takes place in a private room. You will be covered in skin-softening black soap, before spending some time in the steam room, followed by a full body scrub and the application of a soothing body oil. Finally, the therapist will complete a gentle hair washing ritual. You can also opt for a 60-minute massage to follow your hammam. The St Regis Dubai, Al Habtoor City, Sheikh Zayed Road, Dubai, daily 9am to 9pm, Dhs610 for 60 minutes, Dhs990 for 120 minutes with massage. Tel: (04) 4355500. Taxi: The St Regis Dubai. iridiumspadubai.com. This article originally appeared whatsondubai.ae.